Large-scale gene-sequencing projects are revealing hundreds of autism-associated genes. Scientists have begun to leverage new methods to decipher how mutations in these disparate genes might converge to exert their effects in the developing brain. The new research focused on just nine genes, those most strongly associated with autism in recent sequencing studies, and investigated their effects using precise maps of gene expression during human brain development. Led by Jeremy Willsey, a graduate student in the laboratory of senior author Matthew W. State, MD, PhD, of UCSF, the group showed that this set of genes contributes to abnormalities in brain cells known as cortical projection neurons in the deepest layers of the developing prefrontal cortex, during the middle period of fetal development. Though a range of developmental scenarios in multiple brain regions is surely at work in ASDs, the researchers said the ability to place these specific genetic mutations in one specific set of cells – among hundreds of cell types in the brain, and at a specific point in human development – is a critical step in beginning to understand how autism comes about. “Given the small subset of autism genes we studied, I had no expectation that we would see the degree of spatiotemporal convergence that we saw,” said State, an international authority on the genetics of neurodevelopmental disorders. ASDs, which are marked by deficits in social interaction and language development, as well as by repetitive behaviors and/or restricted interests, are known to have a strong genetic component. But these disorders are exceedingly complex, with considerable variation in symptoms and severity, and little consistency in the mutations among affected individuals. Instead, with the rise of new sequencing methods over the past several years, researchers have identified many rare, non-inherited, spontaneous mutations that appear to act in combination with other genetic and non-genetic factors to cause ASDs. According to some estimates, mutations in as many as 1,000 genes could play a role in the development of these disorders. While researchers have been heartened that specific genes are now rapidly being tied to ASDs, State said the complex genetic architecture of ASDs is also proving to be challenging. “If there are 1,000 genes in the population that can contribute to risk in varying degrees and each has multiple developmental functions, it is not immediately obvious how to move forward to determine what is specifically related to autism,” State said. “Without this, it is very difficult to think about how to develop new and better medications,” he said. To begin to grapple with those questions, the researchers involved in the new study first selected as “seeds” the nine genes that have been most strongly tied to ASDs in recent sequencing research from their labs and others. Importantly, these nine genes were chosen solely because of the statistical evidence for a relationship to ASDs, not because their function was known to fit a theory of the cause of ASDs. “We asked where the leads take us, without any preconceived idea about where they should take us,” said State. The team then took advantage of BrainSpan, a digital atlas assembled by a large research consortium, including co-author Nenad Šestan, MD, PhD, and colleagues at Yale School of Medicine. Based on donated brain specimens, BrainSpan documents how and where genes are expressed in the human brain over the lifespan. The scientists, who also included Bernie Devlin, PhD, of The University of Pittsburgh School of Medicine; Kathryn Roeder, PhD, of Carnegie-Mellon University; and James Noonan, PhD, of Yale School of Medicine, used this tool to investigate when and where the nine seed genes join up with other genes in “co-expression networks” to wire up the brain or maintain its function. The resulting co-expression networks were then tested using a variety of pre-determined criteria to see whether they showed additional evidence of being related to ASDs. 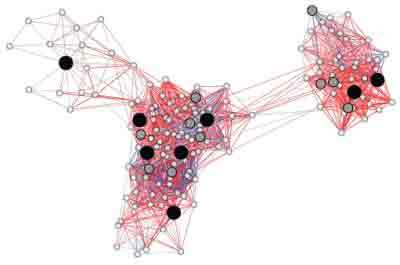 Once this link was established, the authors were then able to home in on where in the brain and when in development these networks were localizing. This proved to be in cortical projection neurons found in layers 5 and 6 of the prefrontal cortex, and during a time period spanning 10 to 24 weeks after conception. Notably, a study using different methods and published in the same issue of Cell also implicates cortical projection neurons in ASDs. In addition to its importance in ASD research, State sees the new work as a reflection of the tremendous value of “big science” efforts, such as large-scale collaborative genomic studies and the creation of foundational resources such as the BrainSpan atlas.